For some people, fibromyalgia syndrome can affect the body’s ability to tolerate alcohol – some individuals with the disease find that they can’t drink at all, some can drink a little, and others find that drinking moderately does not affect their symptoms, and in fact improves them slightly. Whatever the impact on fibromyalgia syndrome, it is important to keep drinking to moderate levels, as drinking too much can have additional long-term effects on health, including increasing the risk of obesity, cancer and heart disease, and causing permanent liver damage. Some people find that drinking any form of alcohol worsens the pain associated with fibromyalgia syndrome – this may be because it increases the levels of inflammation, which worsens many of the symptoms, including pain. However, others find that alcohol in moderation improves the symptoms of pain. After pain, one of the major symptoms of fibromyalgia syndrome is sleep disturbance. Though alcohol can make people feel sleepy and may help people to fall asleep more quickly, once asleep, it affects the sleep patterns – for example, alcohol disturbs the balance between REM (rapid eye movement) sleep and non-REM sleep. REM sleep is dreaming sleep, and non-REM sleep includes deep sleep, and the brain needs both. Alcohol can also make people wake up more frequently, and can make apnoea (a sleep breathing disorder where sufferers stop breathing very briefly) worse, which also affects the quality of sleep. Alcohol can trigger nausea, drowsiness, dizziness and problems with balance in people without fibromyalgia syndrome, and this can be worsened in people with the disease. When faced with a serious disease, including one that can have depression as a symptom, it is tempting to have a drink to make things seem just a little better. Contrary to popular belief, alcohol actually acts as a depressant. It can affect the levels of serotonin in the brain, which can worsen depression, and can interact with antidepressants. 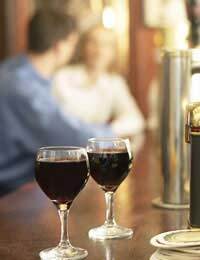 Because alcohol disturbs sleep, it can make fibromyalgia syndrome fatigue worse. Its activity as a depressant also can worsen fatigue. Alcohol can interact with some drugs that are prescribed for fibromyalgia syndrome, including antidepressants, sleep medications, anti-inflammatories and painkillers. Always check labels or ask a doctor or pharmacist before drinking alcohol with prescription drugs. People who have fibromyalgia syndrome who find that they have an intolerance to alcohol can choose to avoid alcohol completely, or accept that they will have certain symptoms. It may be possible to reduce the effects of alcohol on the system by drinking only moderately, taking anti-inflammatory drugs (provided that these are not affected by alcohol), and getting as much sleep as possible. Alcohol can have a dehydrating effect, and this may make people feel worse – drinking plenty of water may help. Try to have two or three alcohol-free days a week. Choosing lower alcohol versions of drinks or adding plenty of mixers, having drinks in smaller glasses, sipping drinks slowly, eating beforehand, and then having a glass of water or eating between drinks can also help.